Golfers that know how to hit a draw have an obvious advantage over players who have yet to master this technique. Hitting a draw involves curving the flight path of the golf ball, less than what would be considered a hook. While hooks are usually the product of a miscalculation, causing adverse results in most cases, draw shots are a calculated curve that slants left (or right for left handed golfers). Basically, while hooks are usually mistakes, draws are an intentional technique used to avoid common obstacles found on golf courses. Drawing the ball away from bunkers, trees, or sand pits works to the advantage of the player, ultimately assisting in their overall game. Many golfers, from novice to veteran, find there are numerous ways to achieve their end goal regarding drawing the ball. When experts are asked how to hit a draw, the answer can be different based on each golfer’s setup. Minor adjustments to your normal stance during your initial golf setup will improve the probability of hitting a draw. Many golfers still setup for the shot in their normal stance, closing the clubface in and taking their normal golf swing. Other players find it to be more beneficial to setup their clubface towards the target, with a closed in stance. Their shoulders typically point to the right of their target in this type of setup. Experimentation with these adjustments will help golfers personalize their own tried and true means to draw out their shot. 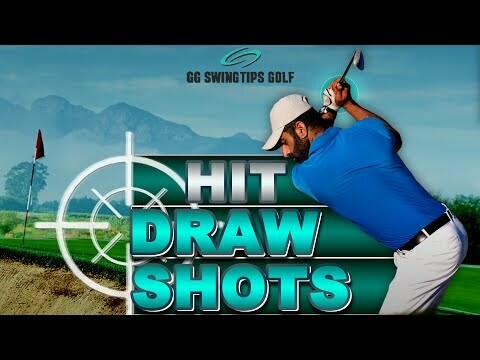 Slight exaggerations to different elements of their normal golf swing and posture will produce varied results for each individual player, so hitting a draw shot should be a technique that receives constant practice and refining. Many golfers forget the importance of their grip when aiming to produce a draw shot. But, some players have found adjusting the strength of their grips to be a method for drawing shots, so this should be considered when perfecting your own style of swing. Drawing the golf ball produces crucial results in difficult situations on the course. Perfecting this technique will serve any golfer looking to improve and expand their own play style. WATCH THIS METHODOLOGY TO SEE IF IT’S RIGHT FOR YOUR GAME. VISIT OUR WEBSITE TODAY FOR MORE GREAT GOLF TIPS! COMMENT below to let us know what you need help with, or what type of video could improve your game.